Discussion in 'General Discussion' started by davidjpowell, Feb 4, 2017. Today was the booked day.. We turned up at the designated time, where she was met by an instructor with an Automatic Evoque. 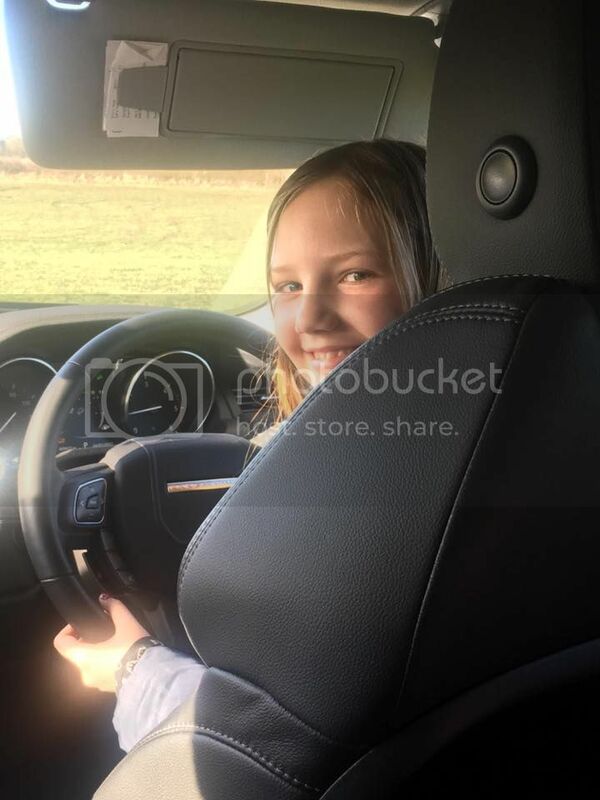 My wife and I sat in the back seat - the instructor drove us up to the first field, sat my 11 year old daughter in the driving seat and gave her a quick briefing. The next hour saw her weaving around cones, driving through the fields, gates and over grass - up hills, down hills and through water. She had a thoroughly fantastic time, big smile.. Thoroughly recommended.. Evoque impressed me as well.. There's something similar but on road at Brands, whcih I know is a long way from you, but as it's MSV organised maybe they do something at a track near you! What a fantastic treat for your daughter. That experience will stay with her forever. Oulton Park does something similar. - I'm not sure about the 4x4 course, but they definitely have an experience on the track. My eldest (who's twelve) is itching to start driving so I'm a bit reluctant to take him on one of these because then he'll be hounding me even more! But I'm thinking about scheduling an hour every 2 months.... This is actually half the cost of the old horse riding lessons. I thought it was surprisingly good value. They do 30 minute chunks as well, but a bit far to go for that period. We did the Leicestershire course - which was a great for the first time. Instructor suggested the North Yorkshire was a but more 'rugged' going forward. All kinds of thoughts spring to mind. That looks like a great course David , I'm sure we have something similar up in Glasgow somewhere. Cool, thank you for the post I have been thinking about this for my 11 year old. There are quite a few of these around an often pop up on the top floor of multi-storey car parks. We bought my boy a driving experience in a Fast and Furious Skyline for his 11th Birthday, which he did at Abingdon last year. Will have to keep this one in mind for his 13th later this year. We took my 16 year old step-son one last year, driving a LR Disco off-road. Mrs BTB got a huge discount on it via Groupon. One thing to watch is that with some of them (including the M-B World ones for example) you are potentially liable for any damage unless you pay extra for insurance. So check the small print. E.g. Participants in control of a vehicle will be held liable for any damage whatsoever caused including but not limited to the vehicle, track or MB World property and premises up to a sum of £1500. Participants who purchase Accident Damage Protection for the sum of £20 will reduce their liability to NIL. This can be purchased at the time of booking the Driving Experience or prior to taking part in the Driving Experience or on the day itself. In the event that the Participant is found to have acted deliberately, recklessly or negligently the Accident Damage Protection shall be void and the Participant will be liable to MB World for any damage and costs caused.